Ancient Indian pictographs (rock paintings) and petroglyphs (symbols carved or pecked on rocks) are claimed by some to be forms of writing for which meanings are known. Allen Dart illustrates southwestern petroglyphs and pictographs and discusses how even the same rock art symbol may be interpreted differently from popular, scientific, and modern American Indian perspectives. This event is free but space is limited. Please register at phoenixpubliclibrary.org to reserve your seat. Allen Dart is executive director of Tucson’s Old Pueblo Archaeology Center, a not-for-profit corporation that provides outreach presentations for children and adults for interpreting archaeology and history founded in 1994. 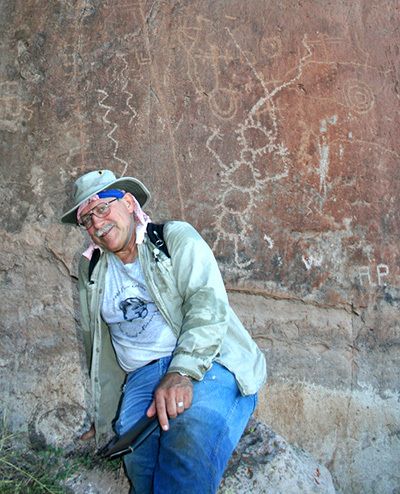 He earned Bachelor’s and Master’s degrees in anthropology, is a Registered Professional Archaeologist (RPA) and has been working in the field since 1975 for academic and federal institutions including the Museum of New Mexico, Santa Fe, and the Bureau of Indian Affairs. This lecture is hosted in conjunction with Burton Barr Library, AZ Humanities, and the City of Phoenix.